This year, WebiMax proudly celebrates its 10th anniversary as a full-service digital marketing agency. Based out of Camden, N.J., WebiMax began in 2008 and has evolved into one of the top online marketing companies in the United States. 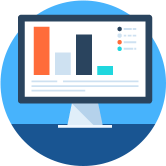 WebiMax is a leading internet marketing company that offers a wide range of services including SEO, paid search, lead generation, reputation management, and web design. According to business.com and many other third-party review sites and publications, WebiMax always comes out on top as a digital marketing agency. In fact, WebiMax is the fastest growing internet marketing company worldwide and has been the recipient of numerous achievements and accolades, including recently being named Best Online Reputation Management Service for Businesses in 2018 by Business News Daily. 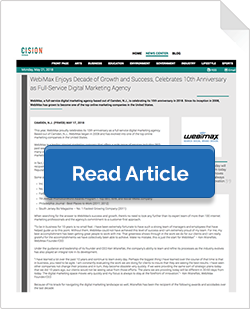 When searching for the answer to WebiMax’s success and growth, there’s no need to look any further than its expert team of more than 100 internet marketing professionals and the agency’s commitment to a customer-first approach… Read Full Article. See How Our Experience Can Help You!